This is my second Rafael Sabatini. 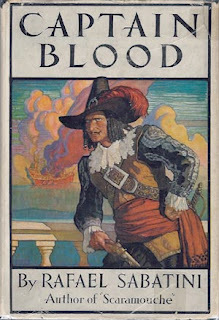 I had great fun with Scaramouche, and after reading Captain Blood I'm once again surprised at how (unjustly) his books are usually eclipsed by their movies adaptations. Still, almost from the first pages I thought this would make the perfect Errol Fynn movie, so you can imagine my joy when I discovered such a movie really existed. I guess Sabatini's stories are just perfect for the big screen. Peter Blood, a country doctor during the reign of James II, was minding his own business and geraniums when he's called to attend a friend injured during an attempt to de-throne the King and put in his place the Duke of Monmouth. For this kindness, Blood is accused of treason and sentenced to slavery in the British colony of Barbados. There he is bought by the malevolent Colonel Bishop of the Barbados Militia, but Dr Blood’s medical training soon becomes highly valuable in the island. He also meets Bishop's beautiful and feisty niece, Arabella. Right from the start there's chemistry between them and one of the books’ biggest delights is reading their witty clash of minds and seeing them plunge into endless misunderstandings (it’s like Jane Austen in the Caribbean!). Blood’s dialogues with his enemies are also clever and beyond what you would expect from your typical pirate story. 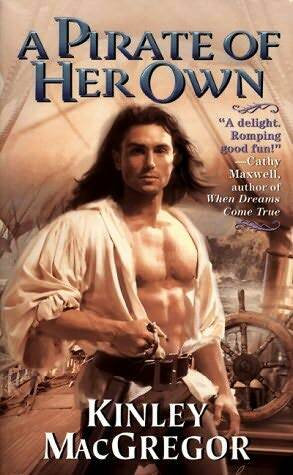 Some months after their captivity, Peter Blood and a group of his fellow slaves take over a Spanish ship and although the newly-elected Captain Blood finds freedom, he has no alternative but to become a pirate. It’s a risky and harsh business, but our hero is a natural! A gentleman-pirate, he does what he must while always following a strict moral code – “He’s chivalrous to the point of idiocy“. An intelligent observation of the facts of human existence will reveal to shallow-minded folk who sneer at the use of coincidence in the arts of fiction and drama that life itself is little more than a series of coincidences. Open the history of the past at whatsoever page you will and there you shall find coincidence at work bringing about events that the merest chance might have averted. Indeed, coincidence may be defined as the tool used by Fate to shape the destinies of men and nations. He's an author that deserves to be re-discovered. Here's the 1935 movie trailer - the drama!